CHICAGO -- A change of scenery and a trip overseas didn't change the fortunes of the plunging New York Knicks. O.J. Mayo fired 22 points off the bench while point guard Brandon Knight had a do-it-all effort of 20 points, six assists, six steals and five rebounds to power the Milwaukee Bucks to a 95-79 rout over the Knicks yesterday at the 02 Arena in London where the NBA Global Games was showcased. The Bucks, who raced to a 14-0 start, got 16 points and five rebounds from Giannis Antetokounmpo while Khris Middleton and ZaZa Pachulia combined for 25 points and 20 rebounds. "This was a great trip for our team. Great team bonding, great sightseeing. It was a pleasant trip," the Bucks' Mayo told ESPN. The Knicks couldn't say the same. Their latest poor performance extended their losing streak to 16, the worst in franchise history. And their record dropped to 5-36, dead last in NBA this season. Carmelo Anthony led New York with 25 points. Travis Wear plugged in 13 and Jose Calderon registered 11 points and nine assists. But there was little help form the rest of the team as the Knicks missed 48 of 68 field goals and were out-rebounded 44-36 and were punished off the offensive boards, 14-5. After trailing 31-13 at the end of the opening quarter, the Knicks got behind further in the second quarter --- 48-25 following a Knight bucket with still 4:43 left before the halftime break. New York ate up some of that 23-point deficit but never got closer than 11 points. "It's just a recurring act. It's the same thing happening over and over again," an obviously disappointed Anthony said. 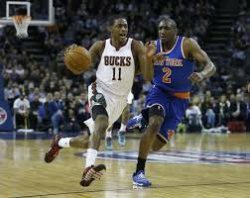 Photo: The hapless New York Knicks couldn't catch up with Bucks point guard Brandon Knight (L) who scored 20 points to help Milwaukee trounce the Knicks, 95-79, in London.